By John P. Mello Jr.
Sony and Nintendo are seeing their game revenues drop, thanks to Android and iOS. In 2009, 81 percent of revenue from portable game software belonged to Sony and Nintendo, but the pair's cut has since dwindled to an estimated 42 percent this year. This information comes to us from an analysis by Flurry Analytics. 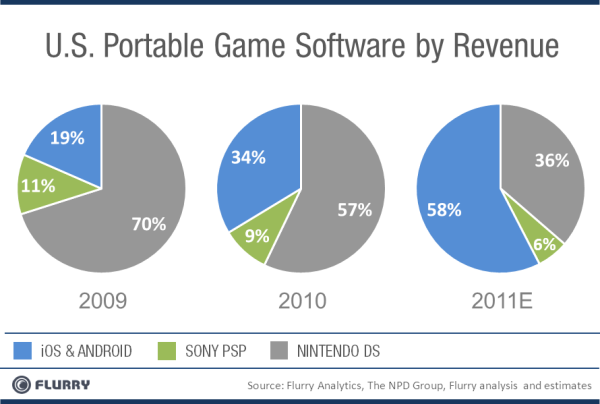 Flurry pegs software revenues from portable games at $2.7 billion in 2009, $2.5 billion in 2010, and $3.3 billion in 2011. "The most striking trend is that iOS and Android games have tripled their market share from roughly 20 percent in 2009 to nearly 60 percent in just two years," Flurry analyst Peter Farago writes in a company blog post. "Simultaneously," he continues, "Nintendo, the once dominant player, has been crushed down to owning about one-third of market in 2011, from having controlled more than two-thirds in 2009." Farago explains that the traditional portable game business model, in which a consumer pays about $200 for hardware and as much as $40 per game, is being undercut by the mobile gaming model. The mobile model features low-priced games (many selling for under $1), as well as "freemium" games in which players can pay for upgrades and extra levels. The mobile model also offers cheaper, more powerful hardware than can be found in the traditional portable gaming market. "As a result, the days of paying $25, or more, for a cartridge at a retail store may soon end," Farago predicts. "Further," he adds, "the installed base of iOS and Android devices has not only reached critical mass, but also continues to grow at unprecedented rates." These developments are bad news for Nintendo, which has seen its share of portable software revenues nosedive from 70 percent in 2009 to 36 percent in 2011, according to Flurry's analysis. "Due in part to its demise in the portable game category, Nintendo is facing its first fiscal year loss since the company began reporting profits in 1981," Farago writes. "Combined with slumping Wii sales, Nintendo is indeed struggling, even with its powerful stable of original IP [Intellectural Property] led by Mario Brothers, and despite the fact that the exchange rate between the Japanese Yen and U.S. dollar is currently in its favor." What's more, Nintendo's woes in the portable market are spilling into its position in the living room. Apple and Google are bringing new hardware into the picture that will compete with Nintendo's consoles, just as those company's smartphones compete with the game maker's portable players. "Beyond 2011, if Nintendo continues to face financial hardship, it may be forced to consider difficult choices such as divesting its hardware business and distributing its content, for the first time, across non-proprietary platforms," Farrago writes. "In our last review of the portable game category, comparing 2009 to 2010 revenue, we believed Mario was already 'standing on a burning platform,'" he adds. "With 2011 numbers now added to the story, it appears that the inferno has intensified, and that Nintendo may truly face a Nokia-like decision to jump or perish in the flames of its own burning platform." Follow freelance technology writer John P. Mello Jr. and Today@PCWorld on Twitter.